No, I'm not talking about the Apocalypse - I'm talking about the last day of Urbana's Market at the Square for the 2010 season. Because, wow - it's tomorrow. 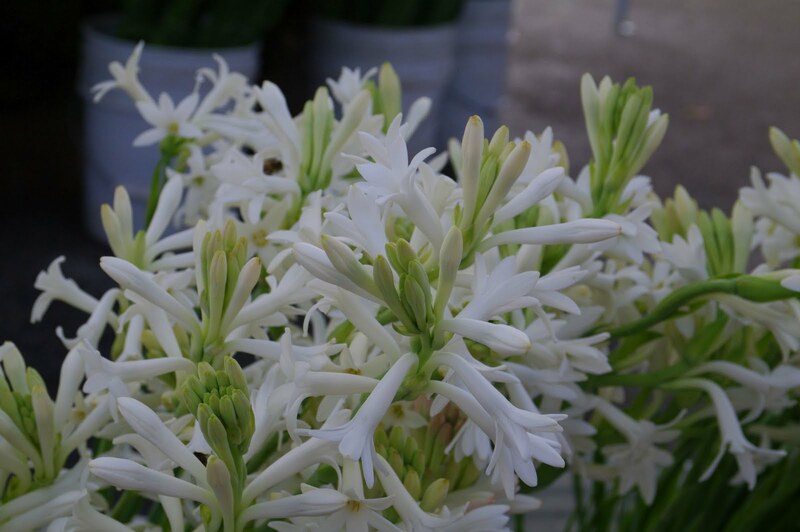 I hope everyone had a great time visiting the Market this season. I hope you tried some new-to-you fruits and vegetables. If you have kids who came to a Sprouts at the Market event, I hope they had a great time and learned something. I hope you met up with friends and made new ones. I hope you found out a little more about where your food and flowers come from, about who makes your bread and makes your earrings or takes the photos you love or knits the scarves or makes the soap. We have lots of things in the planning stages for next year's Market. We're always interested in your feedback - please drop us a line sometime and tell us what you'd like to see. Otherwise, there may be a few postings from time to time here on the blog. Check in every once in awhile and see what we're up to... and thank you so, so much for your support of the Market this season. We'll see you May 7, 2011. REMINDER: the Urbana Business Association's Holiday Market starts next weekend in Lincoln Square Mall - it's like the Market, only indoors and with more of a holiday theme. They go Saturdays, November 13 - December 18, from 8 AM - 1 PM. Please contact the UBA at 217-344-3872 for more information. Halloween is just about upon us, readers. I imagine that by the time Saturday arrives, many of you (or the youngsters in your life) will be wanting to take that costume out for a test run. 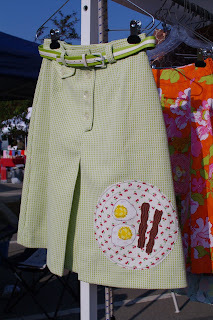 May I suggest dressing up for this weekend's Market? 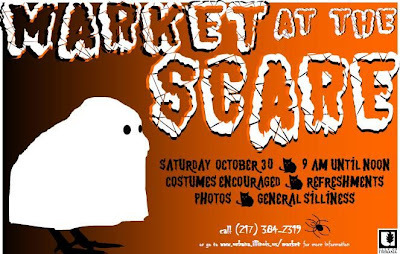 From 9 AM - noon, we'll have treats from Common Ground, candy, and possibly some apple cider to celebrate Market at the Scare. Costumes are encouraged. We'll take your photo. Some of the vendors bring candy and cookies to hand out to kids in costumes. And... the weather will be the best we've had on Halloween weekend in recent memory. What's not to like? 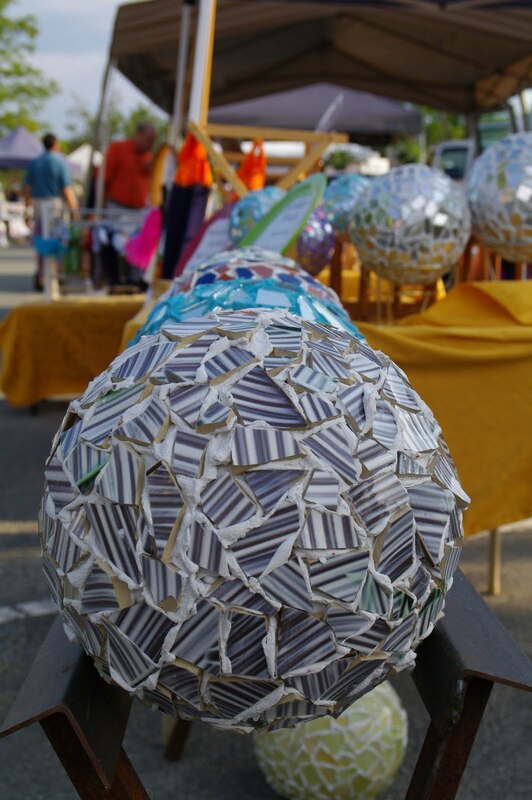 Also this weekend: Art at the Market from 8 AM - noon! It's the last installment for the 2010 season. This month we've got local artist Jessica Roberts - she's conducting a "plantable paper-making" workshop that's open to patrons of all ages, and is completely free. Many thanks to Urbana's Public Arts Program for sponsoring these very popular events this season, and we hope to work with them again in 2011. One other special event this Saturday - we have Professor May Berenbaum of the Entomology Department at the University of Illinois coming in to sign copies of her new book, Honey, I'm Homemade, from 9 AM - 11 AM. We'll have copies of the book for sale for $20, tax included (that's more than a couple bucks off the list price), PLUS Prof. Berenbaum will sign your book! We'll also have information about every honey vendor at the Market this Saturday at Prof. Berenbaum's table. Check 'em out - they may have samples to try and/or cool things to look at. Bees are awesome! Honey is yum! Lay in your winter supply! One of our growers, Jon Cherniss of Blue Moon Farm, mentioned in a recent email update that it's not about what's in season - it's about what isn't? 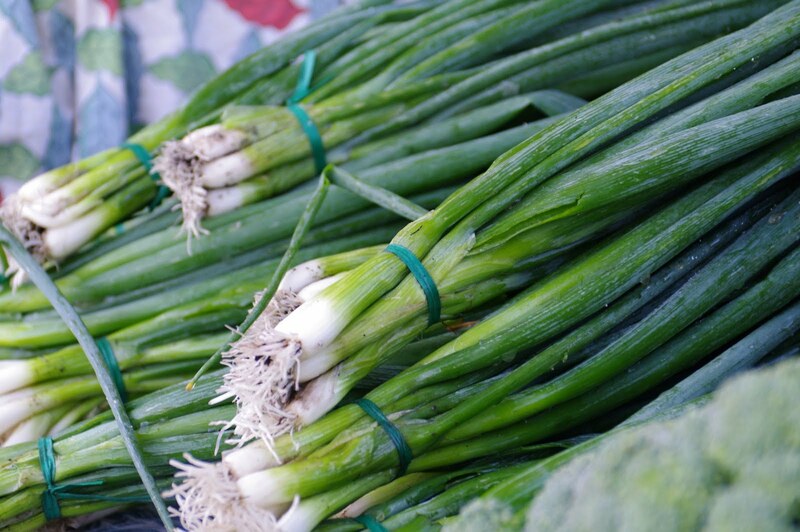 There's more fresh food available now than ever - make sure you shop all four rows of the Market (yep, 4 - we shrink it down when vendor attendance starts to dip) to see everything that's available. Recommended fruits and vegetables: carrots and other root vegetables (we saw some daikon radishes that were as long as a 4 year-old kid's leg), salad greens, apples, squashes. There may be a few tomatoes straggling in, but with the forecast hard freeze on Thursday night, it's iffy. Fret not - there's also plenty of goat cheese, eggs, and meat to round out those veggie/fruit purchases. 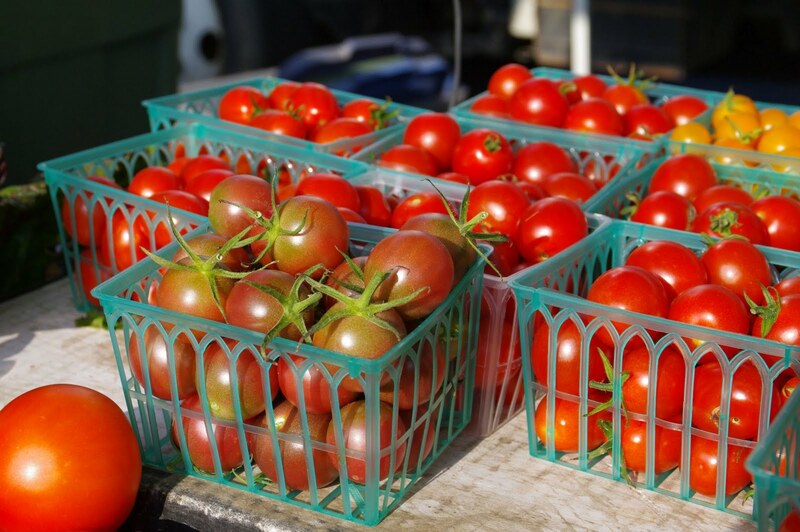 All in all, we couldn't ask for a better weekend for the next-to-last Market of the season. Looking forward to seeing everyone out there! There is no better time than right now to get your Halloween pumpkins for jack-o-lanterning, and there is no better place to procure them than Urbana's Market at the Square. 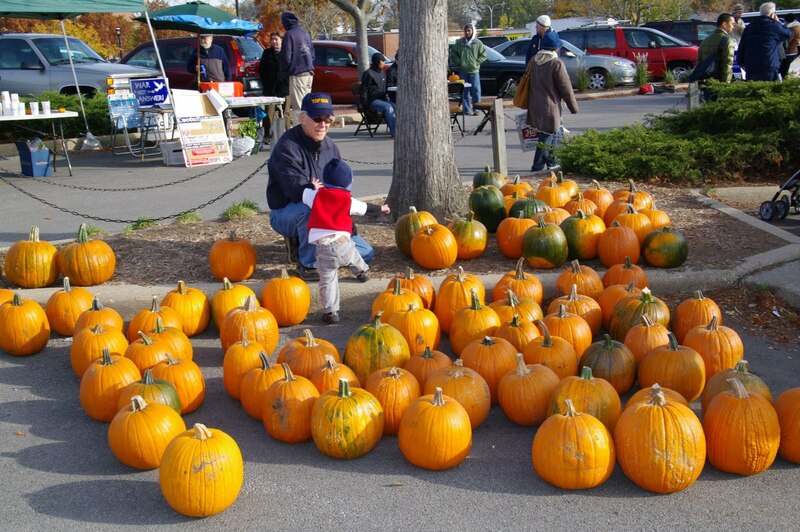 The traditional pumpkins for carving are abundant, but growers also offer more... unusual permutations of pumpkin in all different colors and shapes and sizes. Get a little weird with your decorations this season! The weather is not forecast to be very cooperative for this weekend, but I'm going to be an optimist and say that we'll dodge those raindrops. Here's one reason why - our final Sprouts at the Market event is scheduled for this weekend, and we're really excited about it. This event will be co-presented with the Eastern Illinois Foodbank as they close out their annual Food For Families activities, and the goal here is to teach kids ages 3-8 a little about food insecurity in our area and what they can do to help. As with other Sprouts activities, there will be several tables throughout the Market kids can visit, sample locally-grown fruits and vegetables, and learn a thing or two about local food and our food system. We do ask that everyone sign in at the main Sprouts tent, which will be next to the City tent at the northwest entrance to the Market. The event is totally free and goes from 9 AM - 11 AM. The Market will look different this weekend. As we head toward the close of the season, vendor attendance drops, and we consolidate the Market in order to prevent gaps and to encourage people to shop the whole Market. We did our best to transpose Row 5 vendors into Row 4, but a few are in other places throughout the Market. If you're missing someone PLEASE ASK! 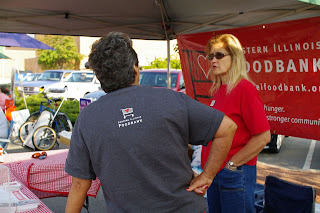 Market staff are more than happy to help you locate your favorite vendors. One more thing - don't forget that the Urbana Business Association's Holiday Market picks up on 11/13 where Market at the Square leaves off on 11/6. They'll be open inside Lincoln Square Mall from 8 AM - 1 PM through 12/18. 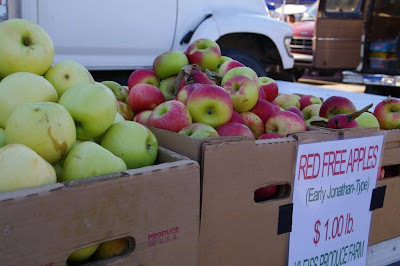 Produce vendors, art and crafts folks, Santa Claus, music, and much more will be featured at this Market - it's so great to know that you'll be able to buy fresh, local food at this Market right up until the holidays. Market geeks: Get your fill of 2008's and 2009's annual reports here! 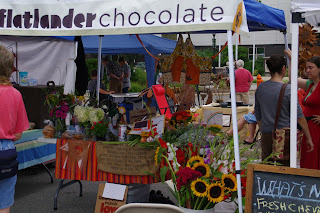 Pictured above are scenes from this past weekend's Market. Stuff to look for this weekend, in addition to what you see above - your Halloween jack-o-lantern, carrots of several colors, spinach (so sweet right now), kales, onions, sweet potatoes, squash, apples and pears... it's definitely fall. 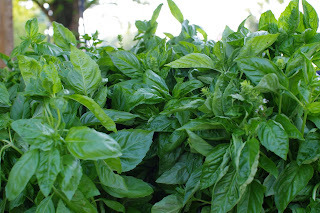 I'm strapped for time, today, so I urge you to look at last week's entry to get more information about this weekend's Eat Here booth, and next weekend's Sprouts event (and UHS Orchestra event). On October 30th, we'll be hosting Market at the Scare (costumes encouraged! ), the season's final installment of Art at the Market, and a book signing with Professor May Berenbaum of the University of Illinois. 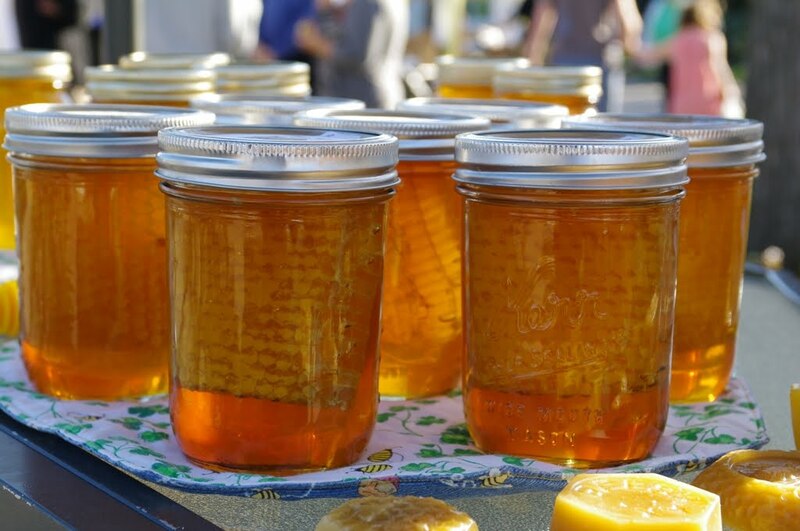 Her book is called Honey, I'm Homemade and is all about bees, honey, and cooking with honey. More information about the book signing and other activities forthcoming - it's a really cute book and we're thrilled to be working with the University of Illinois Press on this project. After 3 seasons as the Market's Boss-Lady, I can safely say that it's the weather that always does it to me. It really stresses me out sometimes. Only occasionally deos the weather do me wrong, like it did last weekend when the heavens opened up while we were getting everything set up and lo, rain cameth down in buckets. At 6:15 AM, it was pouring, it was ridiculous, and all I could do, really, was laugh and hope that the rain left us, which it did (the significantly-less-stressful wind arrived shortly thereafter - another story for another time, perhaps). I have not wept this season. This weekend, it looks like the weather is going to do me (and, by extension, YOU) right. I know, that's what they said last week, but this time I believe them. 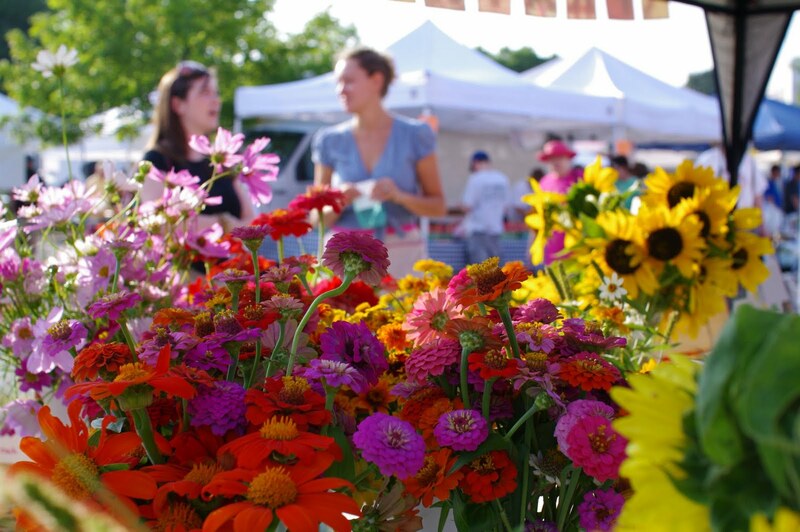 84 unseasonably balmy degrees and sunny this Saturday, Market-lovers. It should be splendid. Soak it up, peeps, because we won't have this weather for too much longer. So, let's talk about food for a few minutes. 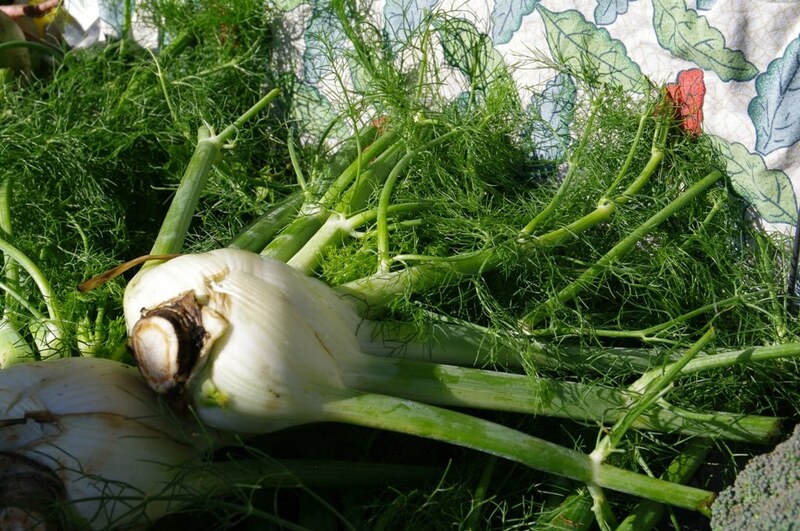 As you know, fall is here and the fall food has been in effect for a few weeks now, while summer stubbornly hangs on with its tomatoes and its peppers and its melons and its cucumbers. While all of those things will be findable this weekend, they are most definitely on the wane; fall produce is in firm control now. Notably, that produce includes fennel, broccoli, various cabbages, bok choi, winter squashes, apples, onions, potatoes, turnips, sweet potatoes, salad lettuces and other greens, spinach, kales and chard, carrots, and much more. After the heat of this summer and the occasional restrictions that can put on the menu (who turns on the oven when it's 95 degrees outside?? ), it's going to taste good to get down to the business of preparing pies, tarts, galettes, roasted vegetable dishes, soups, and more. I guarantee you the spread at the Market will serve to inspire. Come look! As for stuff happening at the Market - this week we have U-Cycle, Urbana's recycling program, out to talk about all things recycling with a little bit of Landscape Recycling thrown in. 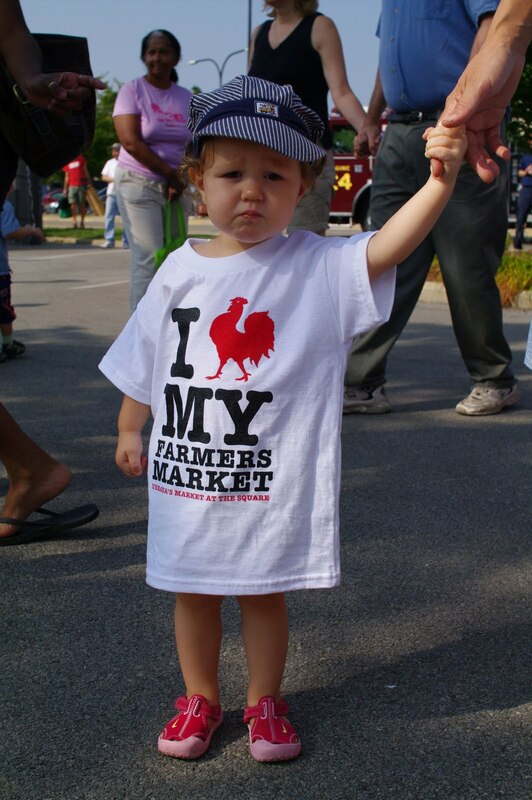 She'll be there from 8-11:30 at the U-Cycle tent at the northwest entrance to the Market. Also, the University of Illinois' Physics Department (maybe even a couple of Nobel Prize-winners) will be on hand to provide Locally Grown Science. Bring your science questions to them in the Community Groups row between 8 AM and noon. 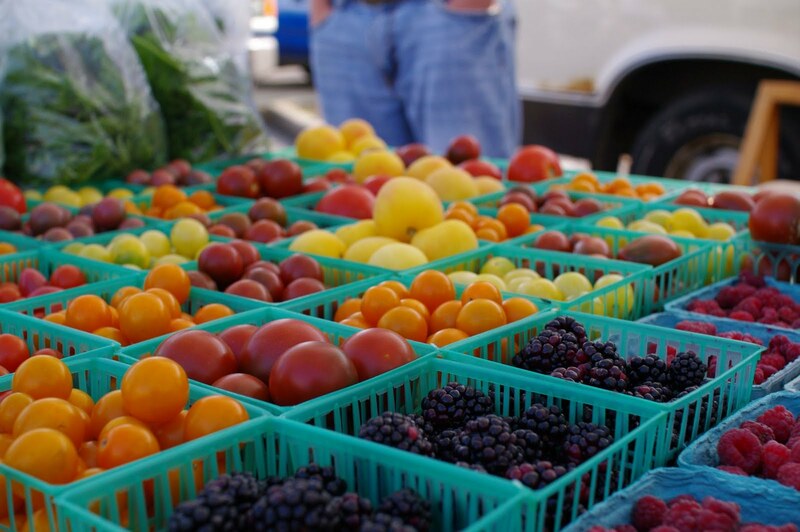 Next week, it's our final installment of Eat Here, our programming designed to educate consumers about the myriad benefits of shopping your farmers markets for locally-produced foods. Stop by the Eat Here tent, located at the northwest entrance to the Market, on 10/16 for more information. Sprouts at the Market's last installment is happening 10/23, and is a collaboration between the Market and the Eastern Illinois Foodbank. Bring your Sprout to the Market that day to participate in a food-insecurity scavenger hunt and to try a few vegetables in season. more information about this event will be available soon, but mark your calenders for 10/23, 9-11 AM! That same day, the Urbana High School String Orchestras will be playing at the Market, also from 9-11 AM. They'll be playing on Walnut Street, which is the barricaded area located just west of the Market. 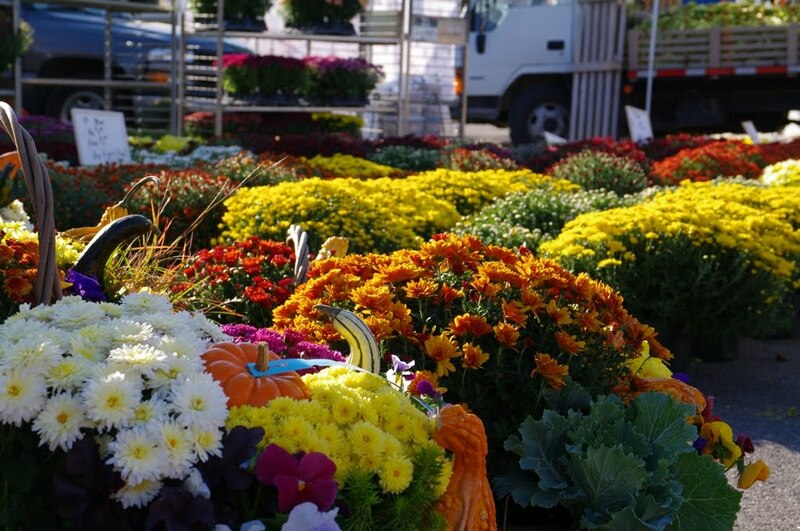 The Market's final day is Saturday, November 6. Starting November 13, the Urbana Business Association starts hosting the Holiday Market inside Lincoln Square Mall. The Holiday Market will run from 11/13 - 12/18, 8 AM - 1 PM. Many of Market at the Square's vendors/growers participate in this market, so please check it out! 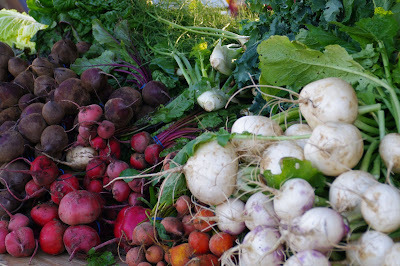 Lots going on as we close in on the end of our season - come visit while the weather's good and the produce is plentiful! Fall's HERE. I see the leaves changing and feel the nip in the air as I ride my bike in inky, chilly darkness to my office on Saturdays and am like, but wait - wasn't it just 92 degrees and life was all nectarines and berries and the first few tomatoes of the season? Weren't we just in the middle of the Sprouts calendar? 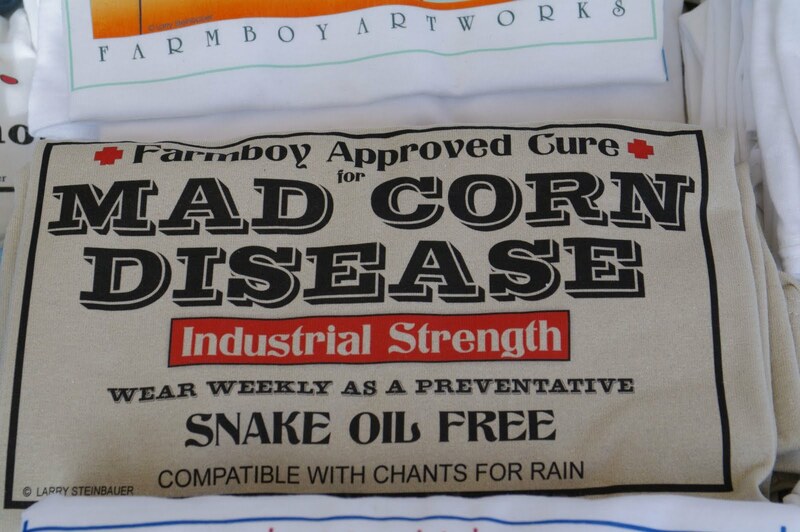 Didn't we just get our very first batch of new Market shirts and bags? Wasn't I just thinking to myself, "I wish Fall would hurry up and get here"? 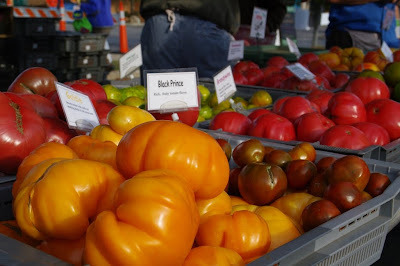 you're at the Market this weekend, make sure you check out the apple selection; have a close look at all the squash coming in - perfect for soup or baking on one of these cool nights; spinach is back and perfect for salads or sauteeing; tomatoes are still as bountiful as they were weeks ago and work nicely with the fall season foods; the broccoli looks sublime. There's food in all five rows of the Market this weekend, including Tiny Greens and Heavenly Delight's cupcakes in Row 5, Prairie Fruits Farm, O'Rourke Family Gardens (check out their sweet potatoes! 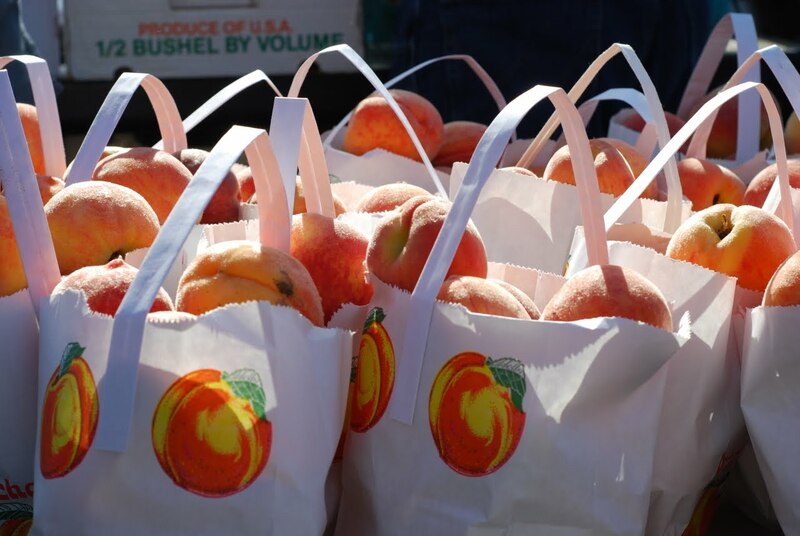 ), and Mileur Orchard in Row 4; Claybank Farms and the Muffin Man in Row 3; Fryer Tuck, Triple S Farms, Pekara, Omega Farm, Upper Crust, and the Moores' inimitable gourd/squash selection in the row along Illinois Street; and all the produce vendors you've come to know and love in Rows 1 & 2. This is also the time of year when we have much to offer in the way of handmade art and crafts available at the Market. 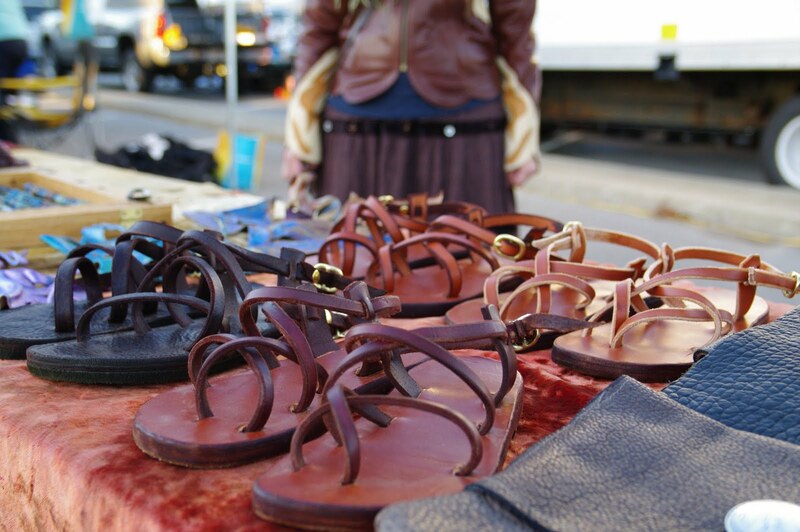 Just this week we'll have woodwork, cards, bath and bodycare, jewelry, carved gourds, glass items, leatherwork, and textiles represented at the Market. It's definitely not too early to get a jump on things for the holidays, either. 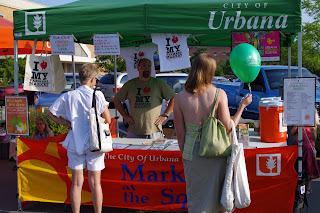 At some point, though, Urbana's Market at the Square has to hang it up for the 2010 season. That final day will be Saturday, November 6. However, fret not! The Urbana Business Association's Holiday Market gets underway inside Lincoln Square Village starting Saturday, November 13, and runs through Saturday, December 18. 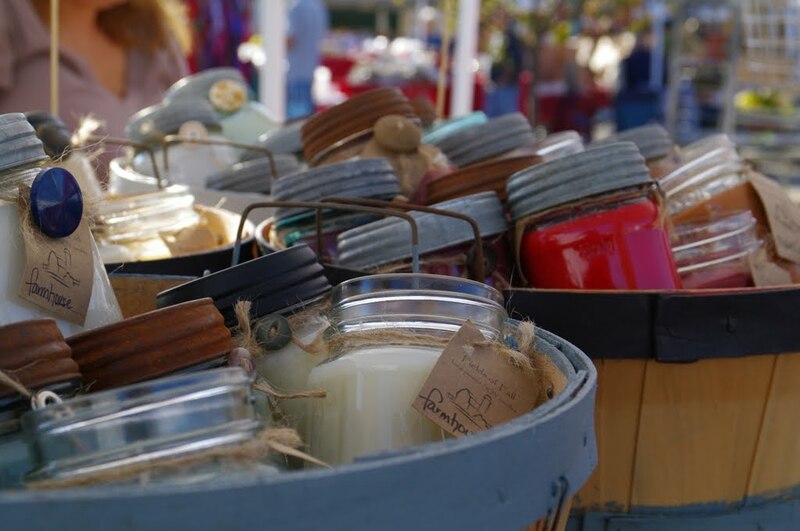 While these markets are operated by different entities, we do share many vendors - many of the folks you see at Market at the Square will be at the Holiday Market, along with some new faces. Add it to your schedule - it's a great way to keep supporting your local farmers and to get some holiday shopping done as winter approaches. 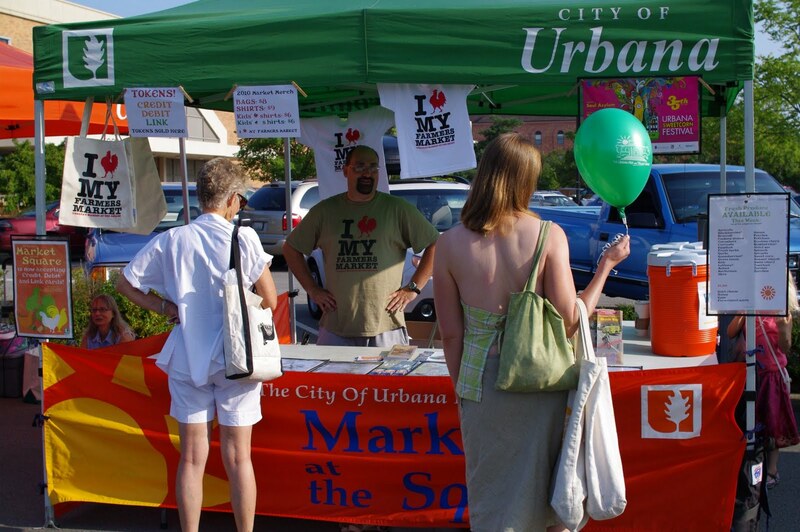 This week: It's the Urbana Free Library's last weekend out at the Market this season. Stop by, say hello, sign up for a library card, get your favorite child read to, pick up a helium balloon... they're usually on-site by 8:30 or so, and stay until 11 AM. Also - Urbana Fire Rescue is having their yearly Fire Prevention Week Parade and Truck Muster - the parade starts at 9 AM on Philo Road and ends up on Illinois Street, right by the Market. Traffic will be two-way on two lanes instead of four, and all parking will be accessible. See some trucks! They'll be there until 11 AM. It's going to be a gorgeous fall day, Market lovers - bring a friend and pay us a visit! 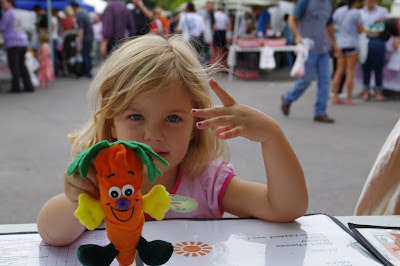 Great Market last weekend - well over 100 kids had a great time at Sprouts at the Market, the weather was fine, the food was out in force, and everyone seemed to be in a good mood, including this gal, who got a carrot "beanie", courtesy of the Family Resiliency Center, for completing the Sprouts activity. As always, though, the produce stole the show. I think we can expect a repeat this weekend, at least of the weather and the food being amazing. While we won't have Sprouts, we'll have a Bike Rodeo for kids and Art at the Market for patrons of all ages, and the U of I Physics Department will be in the Community Groups row to talk science with everybody (I plan to ask about wormholes). I talked a little bit about what's in season this morning on WCIA's Morning show - check it out. ... but you still - still! 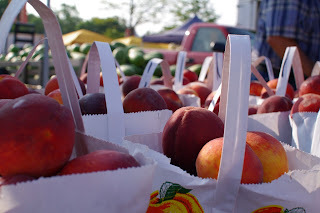 - might be able to nab some peaches this Saturday, if you come early. Just sitting here wondering where the season went. After this weekend's Market, we've got seven of 'em left for the 2010 season. Seven! While it's been hot, it's been a glorious season, I think, and I'm rooting for temperate weather all the way through November 6, which is our last day. Who's with me? 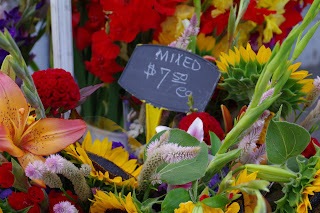 One thing frequent Market-goers will notice is an uptick in fall displays this week - last week I saw more winter squash, more "Indian" corn, more apples, a huge abundance of peppers, fall potatoes, eucalyptus taking the place of tuberose, etc. Sigh. While there's still summer food, it's being eclipsed by fall food. The apples are particularly interesting to me - I think it might be time for an apple galette one of these cooler nights. Again - who's with me, here? It's my favorite way to eat apples, I think. 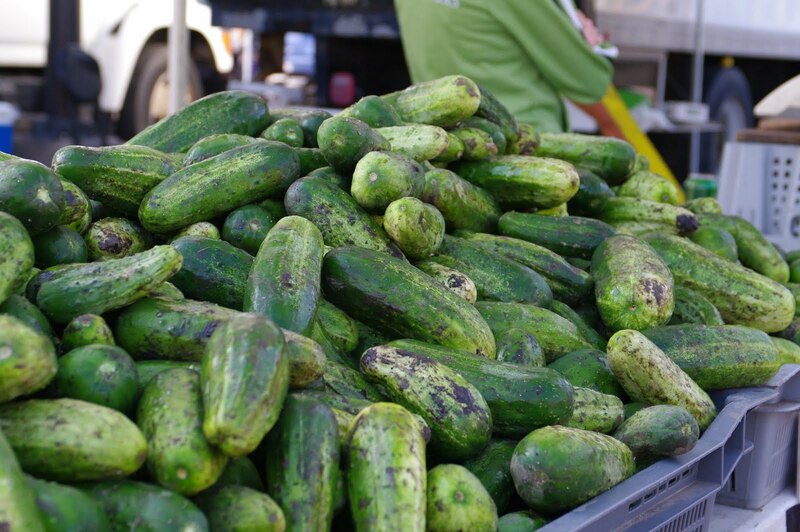 This weekend, we'll have our next-to-last Sprouts at the Market event - we partnered with the Family Resiliency Center - they're big on healthy mealtimes for families - for this one, so it should be even better than it usually is! We'll offer in-season produce tasting for the kids, nutrition information for kids & caregivers, access to farmers, and some giveaways while supplies last. 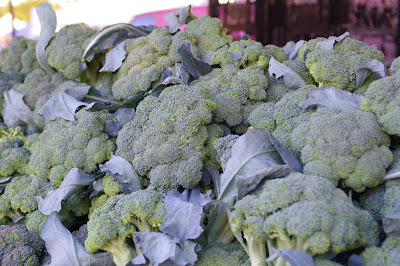 Bring your favorite Sprout to the Market this weekend and see if you can get them to "eat a rainbow" - that's the theme for this weekend's event. As always, thanks to Jen Hewitt and her Army of Studying Dietitians for their hard work and support of this event, and to FRC for the major assist. I hope you'll see more of the FRC with Sprouts in the future. Also, chambanamoms.com will be putting in their monthly appearance - make sure you visit their booth, which will be just west of the City tent at the NW entrance to the Market. Market Menu for those so inclined... otherwise, I'll see you Saturday! I can see the end of the season from here. Ten Markets ago, it was late June, and eight weeks from now, we'll be having our last hurrah (November 6, for those not in the know). Doesn't seem possible, does it? 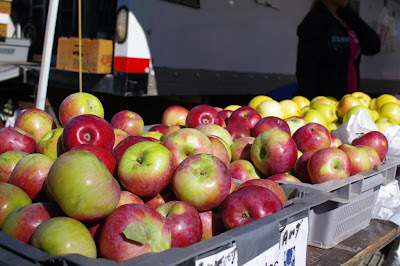 But the apples are here in force, so that means fall is on the horizon. 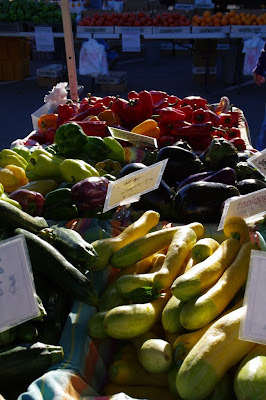 Don't count summer out, though - tomatoes and peppers and summer squash are still in control; there's been sweet corn and there will be more sweet corn; stone fruit is still findable if you know where to look; the pavement at the Market will still heat up when the sun comes out. 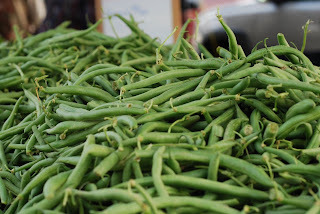 This week: Eat Here will be in the house - stop by the EH tent (right next to the City tent) to check out farmer photos, get some information about Eating Here wherever you are, pick up some credit/debit/LINK tokens to spend in the Market, and - extra bonus! - pick up a FREE Eat Here t-shirt or tote bag, while supplies last. Let's keep supporting the local food scene! You can follow along with Eat Here on Facebook. Yes, we're open for biz this weekend, featuring our regular hours (7 AM-noon, if you're new) and most of the usual suspects. Good thing, too, because the weather this Saturday will be phenomenal. I guess it's fitting, somehow, to have our first real hint of fall on Labor Day weekend, the Unofficial Last Day of Summer. I can tell we're sliding toward the Equinox when this is what things look like at 6:20 in the morning. This weekend, besides terrific weather and the return of some folks who have been missed (Veggie Trails, Fryer Tuck, and Danville Gardens come immediately to mind), we have the Urbana Free Library in residence, right next to the City tent. I'm sure they'll be bringing their swag and some books and will be signing folks up for library cards and filling balloons with helium for the kids, as they always do the first market of each month. Their staff is terrific and it's an AWESOME library. Stop by and say hello. Speaking of saying hello, we've noticed a few people "coming out" on Facebook and admitting they've never attended the Market. 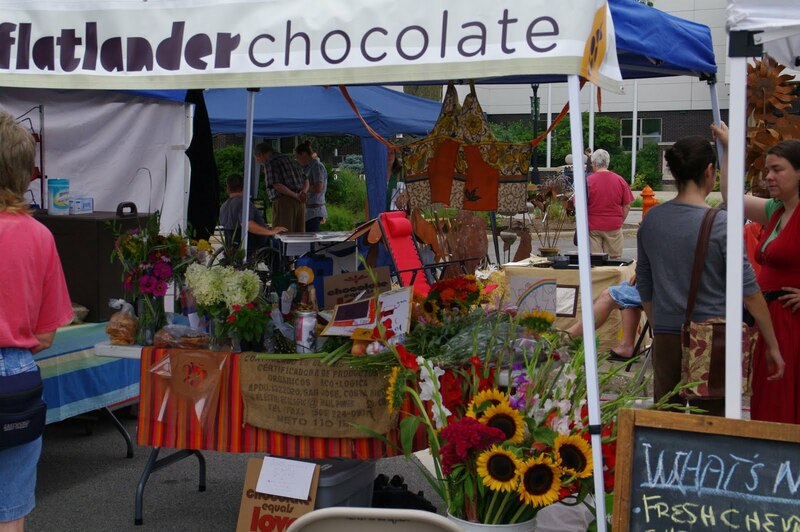 PLEASE stop by the City tent and say hello if you decide to venture to the Market for the first time - we'd love to meet you! 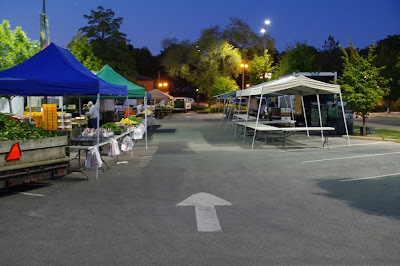 Also, if you're a Market regular with friends and/or family visiting for the holiday weekend, the Market is a terrific place to bring them if you're looking for a way to shop for your holiday provisions and show them a good time at the same time. Again, we love to meet people new to the Market - we're right by the northwest entrance. Speaking of the City tent, a lot happens there. It's the Market staff's base of operations for the day's events; it's where the City of Urbana promotes the Market and other City events and initiatives; it's where you should come if you're lost (or where you should check if you've lost someone); it's where we sell our Market t-shirts and tote bags; and it's also where you can come and buy credit/debit/LINK tokens using credit/debit and LINK cards. Cash and checks are still accepted by all vendors, of course - this is just another way to pay for your purchases that's accepted by all vendors. Questions? just ask - we're happy to explain how it all works. We moved to Urbana just after my son turned 4. 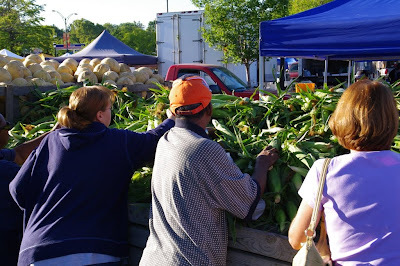 "Urbana Sweet Corn Festival" was too long for him to say successfully, so he called it "the Corn Party" instead. And lo - the name has stuck. It's not just the Festival - though we certainly hope to see you there, enjoying the sweetcorn, taking in the festivities, and staying for Soul Asylum, who hit the main stage around 9 PM - the concept of "corn party" is about this time of the growing season. 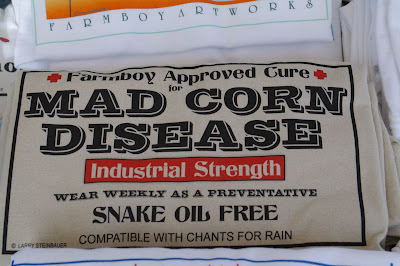 It's definitely a corn party. I mean, look at these people! These patrons are extremely focused on corn! This is how you know it's peak season, the apex of the Market year, the part of the season all of us really wait for, much as we love strawberries and asparagus, the apples and the squash. It's really the tomatoes, the peaches, and the corn - Market royalty. Dig in. Enjoy. Preserve, if you can. Though it's been hot this summer, and fall will be welcome on so many levels, you're going to miss this stuff when it's gone. 10 Markets remain after this weekend. Speaking of, the Market is full, full, full. Arts and crafts will be incredible - it seems everyone's coming out with their best woodwork, their most gorgeous painted silk, their most excellent repurposed fiber items, their prettiest quilts, their best handmade jewelry, their finest soaps and bodycare items, the best photos of the bunch, etc. While we will be missing Veggie Trails and Fryer Tuck this weekend (both should be back September 4), there are plenty of baked goods to keep your energy up while you shop all five rows of the Market. If you don't see it, ASK US! We're at the City tent, at the northwest corner of the Market. Special event: Art at the Market is on deck this weekend, with local artist Justine Bursoni leading a natural paints/painting workshop. All paints are tinted using fruits and vegetables. The workshop is open to patrons of all ages and is completely free. Thanks to Urbana's Public Arts Program for putting this, and all AatM workshops, together. Last week's Market ended up being so amazingly busy (thank you, thank you, thank you!) that I didnthave much of a chance to take photos. 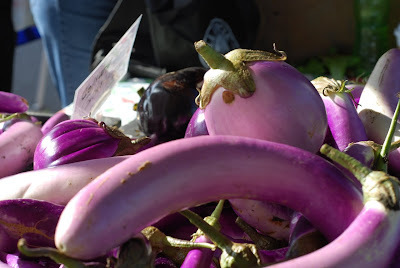 I did, however, notice the light hitting the melons just so, and the way the tomatoes looked like piles of jewels on their tables, and how the eggplant (so many different kinds of eggplant!) glistened, purple/black or white or lavender, and the peaches and nectaries, so orangey-red and begging to be cobblered... I noticed all of that, but didn't capture it. You'll have to come out this weekend and see all of it for yourself. 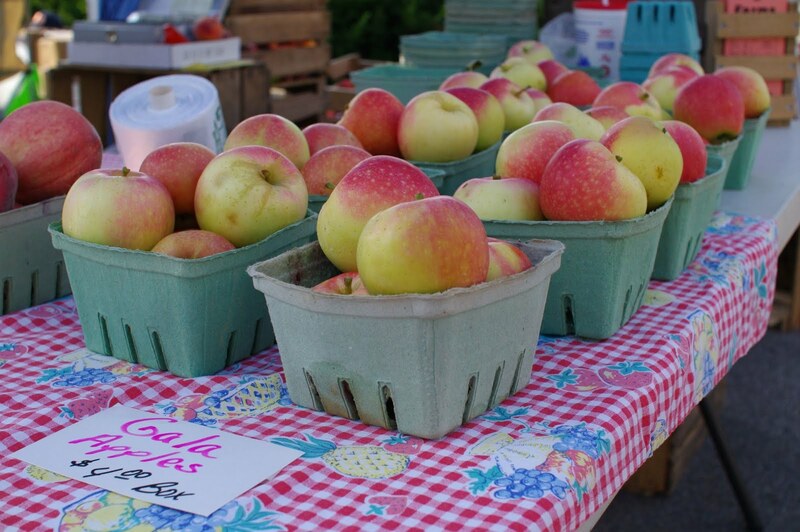 There's a lot going on this weekend at the Market. The U of I folks are back - welcome, students, faculty, and staff! I know it might be hard to roll outta bed on Saturday mornings, but the Market is one of the best places to be on the weekend. Peoplewatching and fresh-baked goods aside, it's a great place to pick up some of your fresh fruit and vegetable needs for the week - and they're all grown here in Illinois. I think you'll find we have some of the finest food grown anywhere. Time to stock yr fridges! - This weekend's special event is Sprouts at the Market, where kids ages 3-8 (younger kids are welcome to participate, though the activities are not geared toward super-young children) learn about farms and food and nutrition. 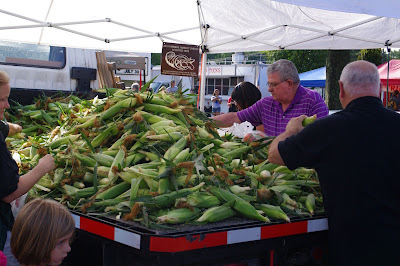 The theme for August is corn - we grow a lot of it here, the Urbana Sweetcorn Festival is coming up next weekend, and it's in just about everything. Kids will have the chance to taste corn in several of its many forms, learn about what makes corn so good to eat, inspect corn plants from tassel to root, and have the chance to ask participating corn growers any questions they may have about, well, corn. The event, which is from 9-11, is free and open to all kids and their caregivers. Registration is at the City tent, located at the NW entrance to the Market site, or you can register at any of the satellite tables within the Market. Everyone visiting all the stations will receive a Certificate of Participation, which is good for 15% any purchase at Art Mart Toys through the end of the day. - Additionally, we're hosting a Bloodmobile from Community Blood Services of Illinois out at the Market - if you're interested in participating in this blood drive, the Bloodmobile will be on walnut Street (the blocked-off area of just west of the Market) from 7:30 until noon. - As if that weren't enough, several animal rescue groups will be out at the Market this weekend in our Community Group Row, raising awareness about their activities. Everything from greyhounds to birds will be represented - check them out! - Last (but certainly not least), I expect Urbana's Fire Rescue to be out with one of their trucks, asking patrons to help "fill the boot" for MDA. They'll be in the Walnut Street area as well. 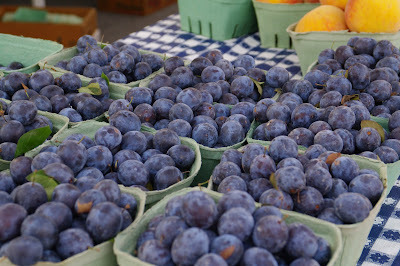 It was a great weekend at the Market - further reinforcing my belief that EVERY week should be Farmers Market Week. It's so important to the community on so many levels. This week: Eat Here information will be at the City tent this week - come check out photos of your favorite farmers in action, get some info about why Eating Here is so important, find out how to shop for and store produce (especially helpful if you're on a budget), and more! 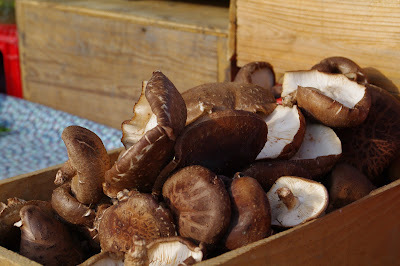 Next week: Sprouts at the Market! 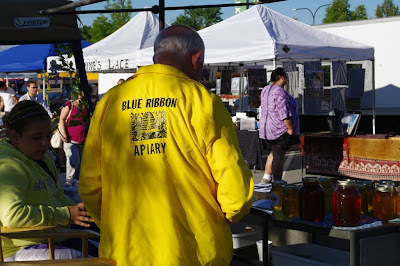 Warm, sunny, full of food, best people watching in downstate Illinois, Market shirts and totes for sale ($9 and $8, respectively), arts and crafts, performers, Kettle Korn... where else could possibly be a finer place to hang on a Saturday morning?